A few weeks ago Wendy and I watched the original Star Wars episode with some young friends at the lake house. 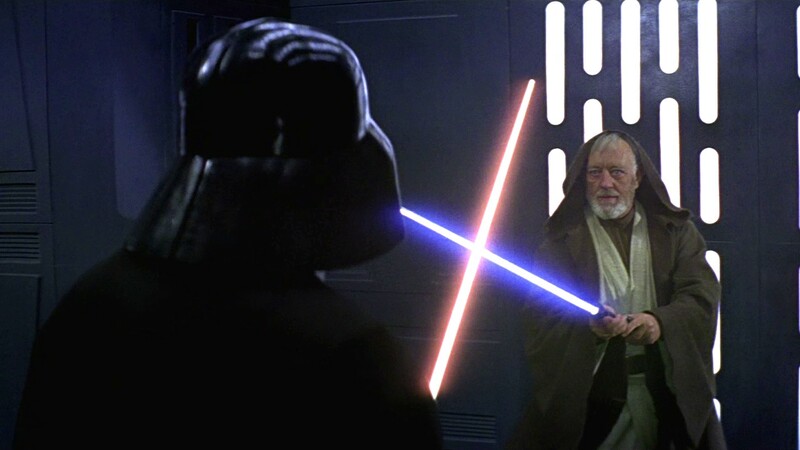 We reached the dramatic scene when Obi-Wan Kenobi is confronted by Darth Vader and the two have a light saber fight while the others escape. You know the outcome. Obi-Wan chooses to shut off his light saber and accept death from his former padawan. The scene prompted a discussion between us about Obi-Wan’s motives for doing so. He clearly realized that there was a larger story playing out and his sacrifice was his assigned role. His words to Vader reveal that he knew his death was not the end but simply ushering him into a new and more powerful role. It’s a dramatic moment. There is no shortage of drama in today’s chapter as Paul, the lightning rod who has stirred up passionate opposition wherever he went, is determined to return to Jerusalem. In Jerusalem he is a wanted man by the Jewish leaders who see him as a turncoat and a troublemaker. Paul’s friends beg him to avoid this trip to Jerusalem and the dark fate that has been prophetically foreshadowed, but he will not be persuaded. Like Obi-Wan, Paul knows that he is part of a larger story being played out, and this is his assigned role. I am reminded this morning of Solomon’s wisdom. There is a time to run from trouble, and a time to confront it head on. Wisdom is knowing and discerning the time you are in.